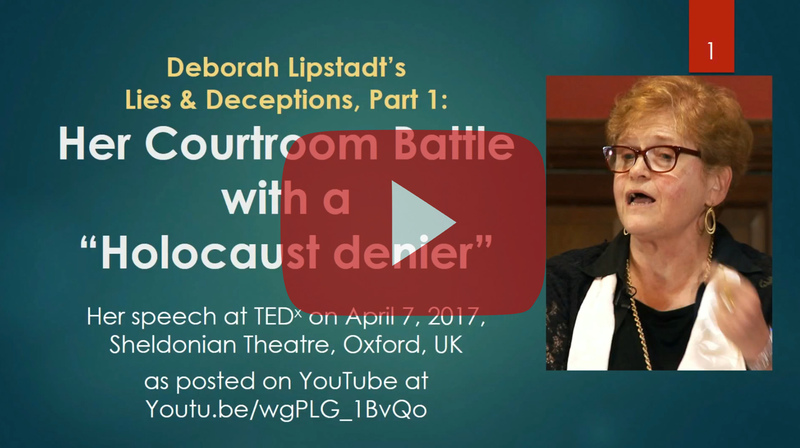 On April 7th of 2017, U.S.-American professor of Jewish history and Holocaust research Deborah Lipstadt appeared on TED-x Talks, where she related her experiences surrounding her courtroom battle against British historian David Irving. The event took place at the Sheldonian Theatre, which is the official ceremonial hall of the University of Oxford in England. This presentation discusses some of the claims she made during that speech, which lasted only some 15 minutes. It is demonstrated that many of her claims are not only false, but are actually deeply rooted in prejudice and a profoundly anti-academic attitude. 2nd, slightly corrected edition.